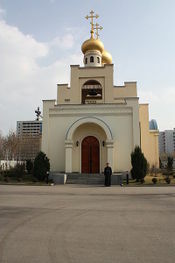 The church is served by two priests, Theodor Kim and John Ra, both citizens of North Korea The church is located in the Chonbek district, tel./fax: (850) 238 14 650. Services are held every Saturday and Sunday. This page was last edited on February 12, 2014, at 03:08.